Frettenham is another large village in the otherwise intensely rural rolling fields between Norwich and the Broads. Someone at Sprowston the previous week had told me that locals there thought of themselves as living in 'suburban Broadland', but I thought this was a better description of Frettenham. Arthur Mee noted in the 1930s that every cottage was given half an acre of land by the late Lord Suffield, although there appears to have been considerable building since then, perhaps on some of those half acres. I was disappointed to find that Post Office Road no longer had a post office, but School Lane still had a school, and heading out of the village to the north was Church Lane. I could see the tower of St Swithin from a fair distance - it is a big church, quite a contrast with Spixworth, from where I'd just come - but I was surprised to find it all alone, out in the fields. The sprawling graveyard is lined with old trees, and there was a sense of abandonment after the crisp suburban streets of the village. But this is an illusion, because Frettenham church is still very much in use. Indeed, in recent decades it has undergone a considerable amount of work, as will become obvious inside. 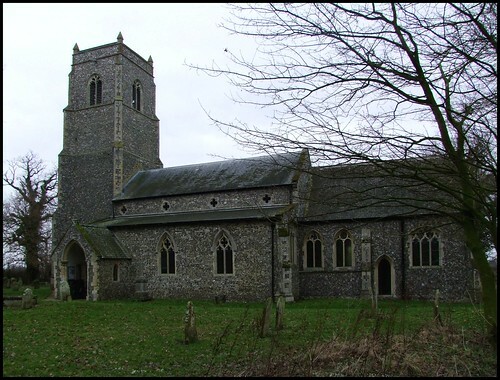 At first sight, St Swithin is a typical late medieval East Anglian church, with aisles and a clerestory. However, the rebuilding here was relatively early, as you can tell from the quatrefoil windows in the clerestory. The chancel is all Victorian, I think. A neat obelisk of a war memorial is set beside the south face of the tower. You step into a large, clutterless interior, which is the ideal setting for some extraordinary modern art works. They appear to date from the 1980s. The first you see on entering is a brightly coloured St Christopher on the wall of the north aisle. Both St Christopher and the Christchild are rather sombre, the slippery rocks beneath the surface of the water perhaps concentrating the Saint's mind. Turning to the east, you see what is surely one of the most remarkable east windows in any Norfolk church. It depicts the Resurrection - or, more precisely, the Harrowing of Hell, the Risen Christ fending off Death while ushered by an angel. The churchwarden working at the back of St Swithin this February morning told me that it was designed and installed by a working party from the Manpower Services Commission, a claim also made in the church guide, which seems extraordinary to say the least. I'd love to know more - presumably they were led in their work by an artist, and so I wonder who it was? There are other, smaller works set into the upper lights of the chancel north windows, which the churchwarden told me were test pieces. One depicts the keys of St Peter, another two fish. The lady told me that one of the boys in the working party had gone on to study stained glass design, and was today a stained glass artist himself, which is rather lovely. There are some composites of medieval glass reset in the south side of the chancel, both angels, one of them a St Gabriel from an Annunciation scene. The third piece of modern work is the stencilling around the window splay at the east end of the south aisle. It depicts scenes from the life of St Swithin in roundels connected by vines. Unfortunately, it has suffered rather badly from water soaking through at the top. I was told that it was done by a local man, a Buddhist, and so perhaps he was responsible for the St Christopher as well. The Purbeck marble font is reset on a modern shaft, and the only other medieval survivals are two female brasses up in the chancel. The best of these is to Margaret Whyte, who died in 1435, but also noteworthy is the inscription beside it to Richard Woodes, Rector here, who died in 1620, having been a paynefull and profitable minister of God for 48 years. This hardly sounds like a compliment, but presumably means that he worked hard, and that everyone learned a lot from him. Such Puritan sentiments would resound down the following half century, as hundreds of sacramentally-minded Rectors and Vicars in East Anglia lost their parishes and homes to the sequestration courts of the Commonwealth period. They would be described in the witness accounts as 'scandalous ministers', and their charges would include drinking in alehouses and consorting with common whores; but their only real crime was to disagree with the government, and to fail to collude with the Puritans' plan to recast the minds of the common people in their own mould. It all sounds very familiar.